Staying healthy in the winter is kind of important, you know? That’s why we like to prepare ahead of time with our stay-healthy medicine cabinet. We’ve got 5 syrups here that you have to make, to promote health during the cold months, including some of our favorites! As summer starts winding down and the natural sunshine starts wearing off, our immune systems starts wearing down. The lack of exercise, water, and natural sunlight shift our bodies into a less healthy state, and make us more susceptible to illness proliferating in our bodies. Along with a healthy diet, nourishing traditional foods, and plenty of water and rest, you can make syrups and bitters that will bring you through the winter months with less illness. 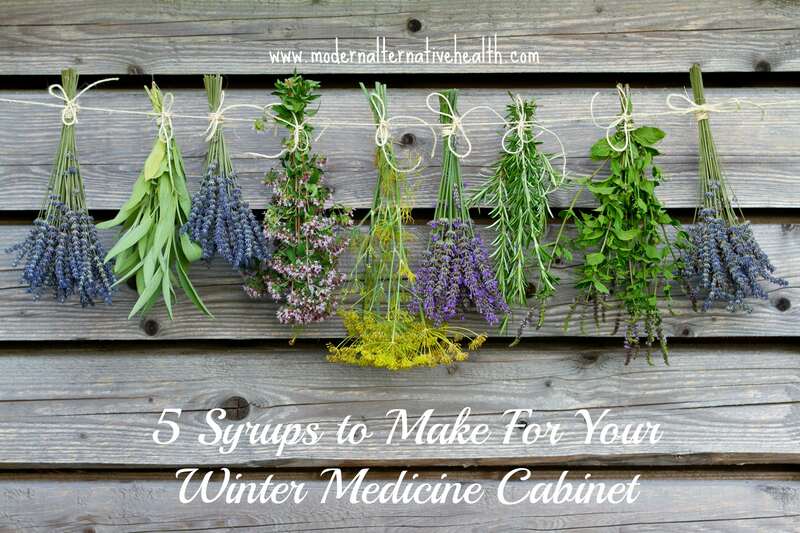 Create your winter medicine cabinet ahead of time to stay healthy! Instead of breaking the bank, rolling up your sleeves for the mercury-laden flu shot, or saving up for doctor’s visits, load up on do-it-yourself syrups to boost your immune system and overall health before the sicknesses come blowing in. 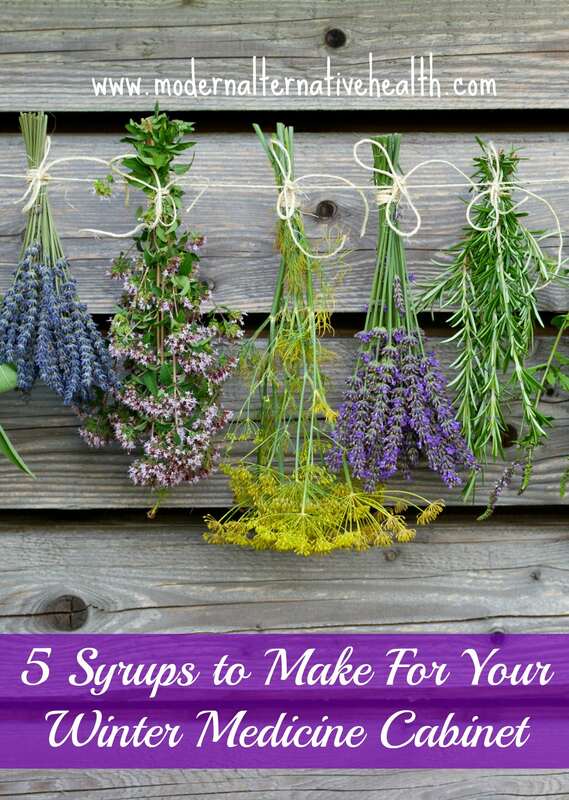 – A handful of the herbs, fruits, and ingredients in your syrup. Source local and organic when possible. – To make bitters, you will need 100% proof alcohol, or vegetable glycerin (for children). Elderberries are a powerhouse of antioxidants and immune-boosting flavonoids. Elderberries are anti-viral and anti-inflammatory, and some research shows that it can even prevent cancer. Poultices of the berry and flower have been used to treat viral and stomach illness for centuries. The berries include a high dose of vitamin A, as well as one of the most potent sources of vitamin C. This is a must-have in your winter medicine cabinet. Soak the berries in filtered water if you are using dried. If you do so, use the portion of water the berries soaked in into your water calculation. After soaking,place the water, berries, and honey in a small saucepan with lid. Turn your stove on to a very low heat. Allow the mixture to heat for 20-45 minutes. Strain the mixture into a jar, leaving out the berries. Your syrup should be a rich, purple color (oh yes, it stains!). You can make your elderberry syrup more syrupy by adding more honey, or less, by adding more water. I typically make a more watery mixture, so that it is easier to consume in times in health, and more of a syrup to line the throat during illness. Pineapples house enzymes which have loads of digestive and anti-inflammatory benefits, as well as loads of vitamin C. Many studies have shown that pineapple juice is actually much more effective than cough syrup. That’s an awesome addition to your winter medicine cabinet. Warm honey on low heat, and remove from heat. Add pineapple juice, lemon juice, and optional add in’s, if desired. Keep refrigerated for up to two weeks. The enzymes and good microbes in honey can cure a respiratory cough and sore throat, and break up mucus stuck in the lungs and esophagus. It also will help your little one sleep during a cough. In the Sept. 2012 issue of Pediatrics, stated that some honey before bed will both help a child sleep and soothe his cough. Both the FDA and AAP have noted that most cough syrups are not safe for children under the age of six (6). So, what’s a natural mama to do? Turn to their local bee farmer, and an age-old remedy: raw honey. – 1 tbsp of filtered water, if desired. Warm the honey on low heat, and add water and honey if desired. It is fine to simply give warm honey as cough syrup! To make a syrup to keep, add the water, and cinnamon for taste if desired. Mix thoroughly, and place in glass jar. Keep refrigerated for up to two weeks. Using your local raw honey, combine with a starch, such as a fine flour or arrowroot powder, mix the honey and powder into a thicker paste. Apply the paste to the chest, on the lungs for coughs. Cover with a warm rag (stick in or on your oven when it’s heating up or down after/before baking), and allow to sit for 20 minutes. This will break up the phlegm, and allow the child to cough it up. Repeat daily (nightly is best), as needed. You surely know the many anti-inflammatory benefits of turmeric. Golden milk or turmeric tea is safe for children, however, the taste may not always quite suit them. I set out to make a simple syrup that would get all that goodness into my little sweet tooth. What better way to get the unending benefits of turmeric into your babe than to wrap them up into some sweet honey? This is a staple in our winter medicine cabinet! Warm honey, and remove from heat. Add in the turmeric, cinnamon and stir in your filtered water. Keep refrigerated for up to two weeks. Bitters have been used to heal digestive issues and maintain gut health for a long time. In fact, some say they are even more beneficial than probiotics (no, say it ain’t so!). They are also implied in eczema, allergies, and asthma, as well as hormonal conditions and even weight issues (too much and too little). So how do they work? The long and short of it is that you have bitter taste receptors all along your digestive tract–from your tongue, to your intestines, to your stomach and pancreas, which stimulate digestion of toxins and release enzymes to properly digest proteins. This is an excellent addition to your winter medicine cabinet. Offer bitters before meals to improve digestion, or throughout a bout of illness. As a general rule, use 1 part of dried bitter to 5 parts liquid, or 1 part raw bitter to 2 parts liquid. Cut your bitters materials, and place in 4 oz glass mason jars. Cover with alcohol completed, and seal lid tightly. Shake bitters daily. Open the bitters to take a taste every few days – some take one day, others may take two weeks, and the longer they sit, the stronger their taste will be. When complete, take off the lid and strain out the bitters materials, discard. Mix in warmed honey and water, if desired. Place entire bitters mixture into a dropper, and enjoy! Bitters do not need to be refrigerated. Possible bitters: burdock root, dandelion root, coffee beans (you read that right! ), yellow dock, rosemary, cloves, anise, lavender, lemongrass, nutmeg, chile, citrus peels, ginger, nutmeg, cinnamon, cocoa beans, vanilla and dried fruits. A spoonful of sugar helps the tincture go down…try this bitter chocolate recipe if your little one is not stomaching bitters well. Mix all ingredients, warming honey if necessary. Keep refrigerated for up to two weeks. Making your own syrups is fun, and can save you a lot of money. Including your children in making these remedies can teach them how to naturally heal and prevent illness. Create yourself a winter medicine cabinet, and be ready for the cold weather ills. What syrups have you made for your winter medicine cabinet? Thank you for the thorough recipes! I’m going to start working on these.